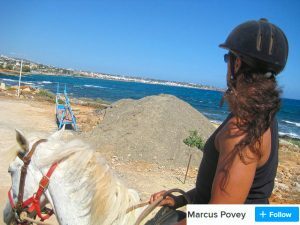 Crete horse riding is a very popular pastime and organised tours are an excellent way to see parts of the island you would never see on foot or by car. There are quite a few horse riding stables on the island of Crete all offering excellent service and a warm friendly welcome. The horses are normally well cared for and the owners speak good English and are normally the travel guides for the day or duration of your holiday. When choosing to go on a guided horse tour then they have different excursions based on your skill levels and how comfortable you are with the horses. We will take a look at the companies who run horse riding tours in Crete so depending on where you choose to holiday on the island you can take that information and contact the company if you want to go horse riding. The first company covers Hersonissos, Stalis, Malia and other close by towns and villages and is called Gregory’s horse riding. Situated next to Star beach village across from a supermarket you will find these well looked after stables. The owner from what I remember is a little crazy but very friendly and eccentric. He will match your horse to your personality and offers guided tours into the mountains around Hersonissos and also horse riding on the beach in the evening. The Crete horse riding trips venture into the mountains areas and into the smaller less commercialised villages where you will see local men sitting outside playing backgammon and drinking Ouzo or Raki. Another very well known and reputable company is Odysseia Stables who offer a package tour or holiday with an option to stay at their wonderful hotel in the Dikti mountains. Odysseia stables offer tours around the Lassithi Plateau but mainly for the experienced rider as it goes for around 160km and you can get quite saddle sore if not an experienced rider. The tour last for 8 days and you will see some amazing sights and a few chances to take a dip in the cooling Libyan Sea and enjoy the comfort of traditional Cretan hotels. The stables also do many different packages including start packages and courses for your skill level of horse riding and you can find more information on their website.